As covered in my recent posts, one of the aims of the Festival of Britain was to show that after a long period of war, austerity and rationing there was a brighter future ahead. The other impact of the period since 1939 had been the lack of any opportunity for holidays, to travel and to explore either Great Britain or abroad. The only travel came with being in the armed forces or the associated war effort with the dangers and hard work that these activities involved. If you were young in the late 1940s and early 1950s travel options were limited, foreign holidays were still some years in the future, British holiday camps were being converted back after years of war use and for most people, any spare cash was in short supply. A relatively cheap option was touring the country by foot or cycling and in this period, membership of organisations such as the Youth Hostel Association and the Cyclist Touring Club reached their peak. This was the option taken by my father, cycling across both Great Britain and Holland with friends and staying at Youth Hostels. National Service also took him out of London and whether cycling across the country or in the army during National Service, his camera was always with him during this time. 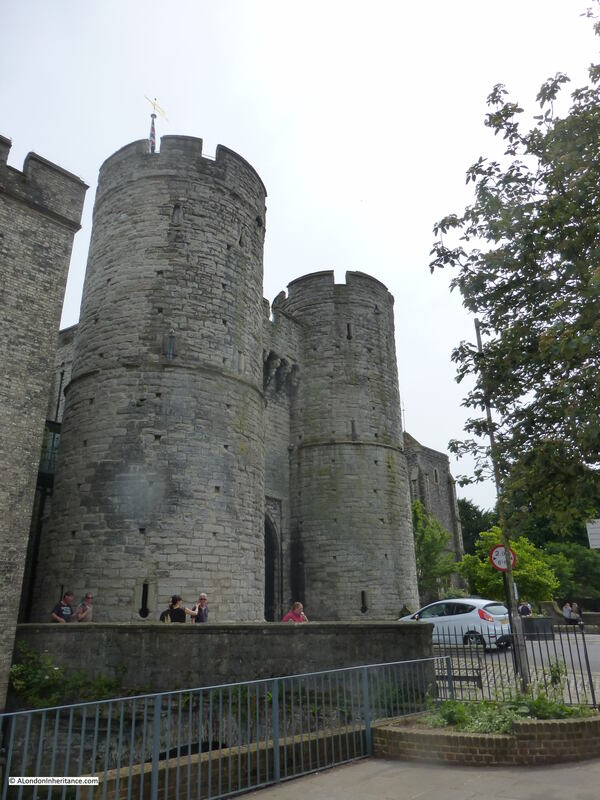 For the month of August, I am going to leave London and return to a sample of the places he visited, and for this week’s post we have travelled into the county of Kent to explore the city of Canterbury. Canterbury is best known for the Cathedral and the murder of Thomas Becket in the 12th century after which Canterbury was a destination for pilgrims with Geoffrey Chaucer’s Canterbury Tales telling a series of tales by each of the pilgrims on their way from London to Canterbury in the 14th century. It is an old city, the foundation of the See of Canterbury by St. Augustine dates from the year 597 with an earlier Roman town (Durovernum Cantiacorum) occupying the site of an even earlier settlement. 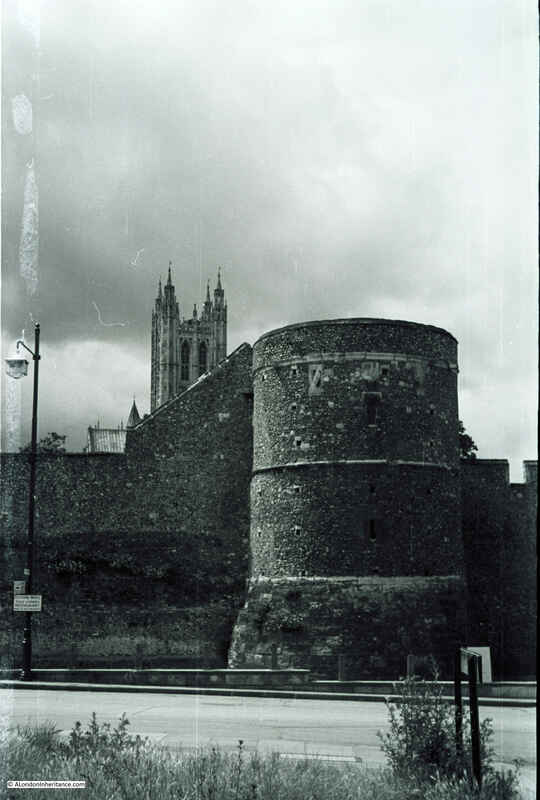 A city wall surrounded the centre of Canterbury, originally the walls of the Roman town with many changes to the build and configuration of the walls and gates in the following centuries. Today, large sections of the wall remain, and it is on the road approaching one of the gates that we will stop and compare the scene. This is St. Dunstans Street looking towards the Westgate. I will not put any text between these two photos as close together it is possible to see how remarkably similar the view is between 1948 and 2016 – 68 years since my father took the original photo. On the left is the Falstaff Hotel. Hopper’s Bakeries next to the Falstaff is now a Coral betting shop. 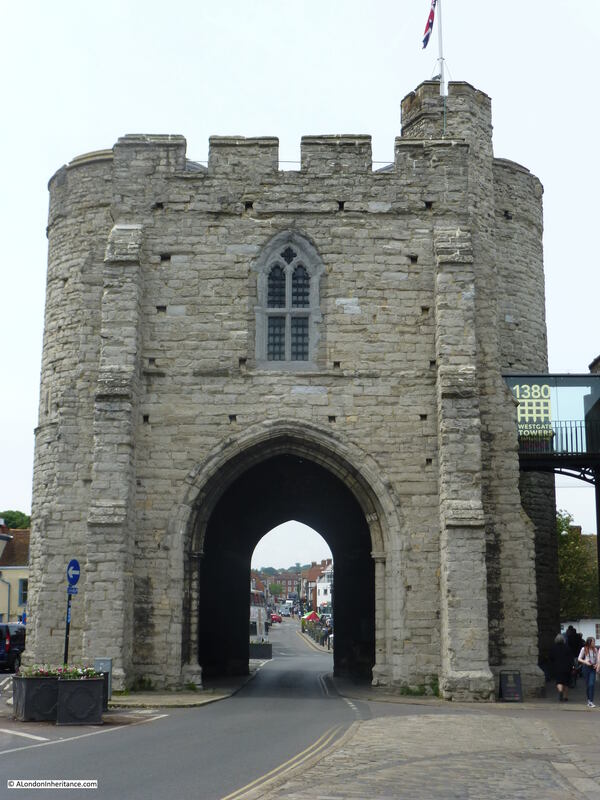 At the end of the street is the Westgate, one of the gates that connected the roads leading into Canterbury with the centre of the city. Architecturally, the scene has not changed. One difference is the amount of street furniture that now seems to clutter all streets, no matter what town or city you visit. Compare the pavements of the two photos and the empty pavements of 1948 look much better, they are easier to walk and do not detract from the surrounding buildings. There is a member of the armed forces in the 1948 photo. A few years after the war and it was still very common to see people in uniform walking the streets of the country’s towns and cities. 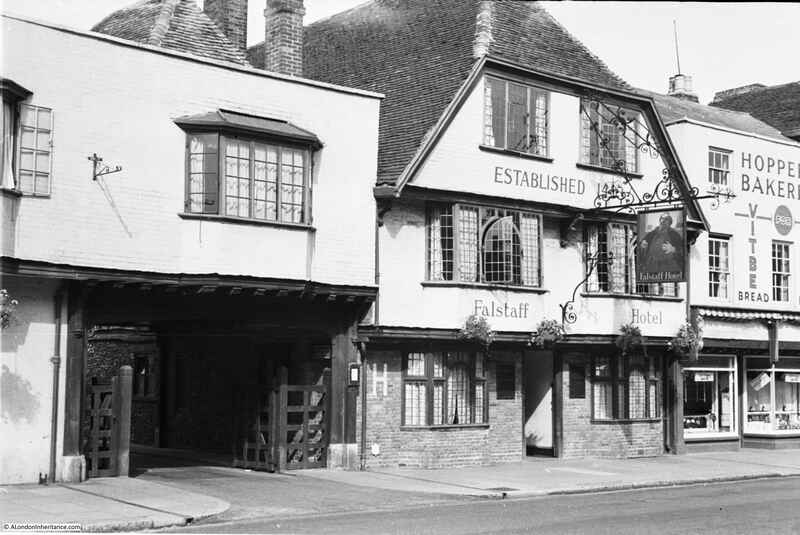 Another view of the Falstaff Hotel. I much prefer the earlier colour scheme to that used today and the sign hanging from the hotel in 1948 was much more representative of the hotel name, Falstaff being Shakespeare’s cowardly knight who spends too much time eating and drinking. 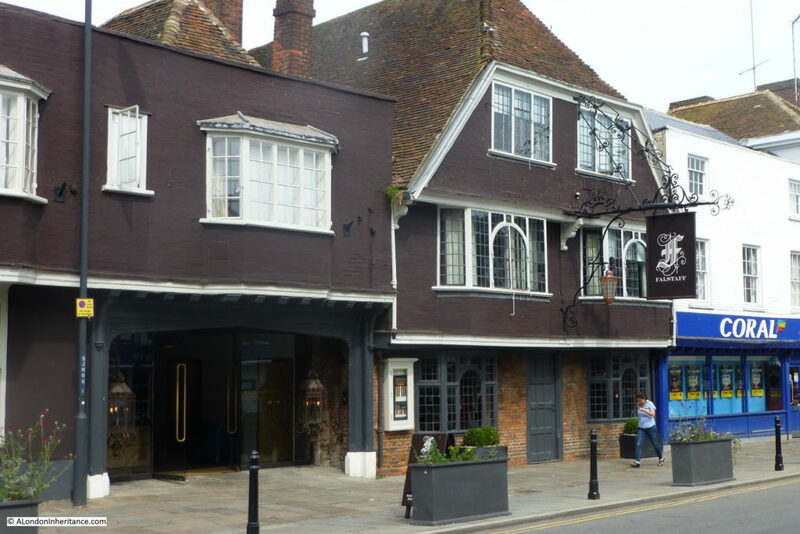 Dating from the 15th century and originally called the White Hart the coaching Inn changed to the current name in 1783. The original entrance on the left of the 1948 photo which would presumably have led back to a yard and stables area in now the main reception for the hotel. At the end of St. Dunstan Street is the Westgate, which has the distinction of being the largest intact city gatehouse in England and the remaining gate of the seven that originally provided access through the city walls. 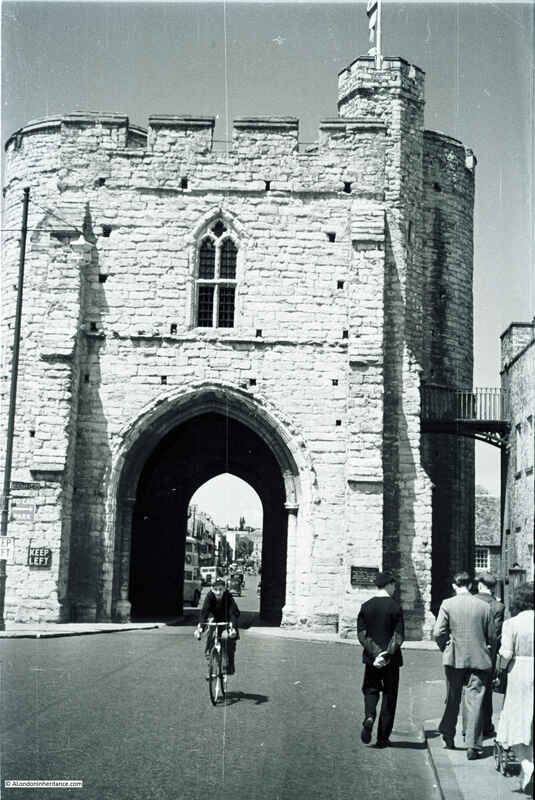 The Westgate dates from around 1380 and is in excellent condition so must have been repaired many times over the intervening centuries but is still a fine example of a medieval gatehouse. Pass through the gate and into St. Peter’s Street and this is the view of the Westgate from the other side. Canterbury is a wonderful city for walking. 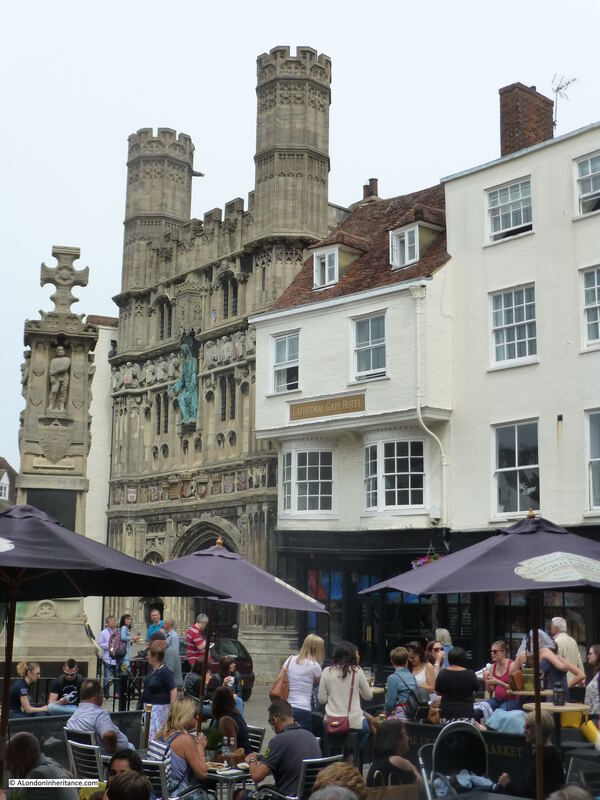 The Cathedral and the surrounding streets attract the majority of a very busy tourist trade, however walk down the many side streets with names such as Beer Cart Lane and a quieter Canterbury can be discovered. 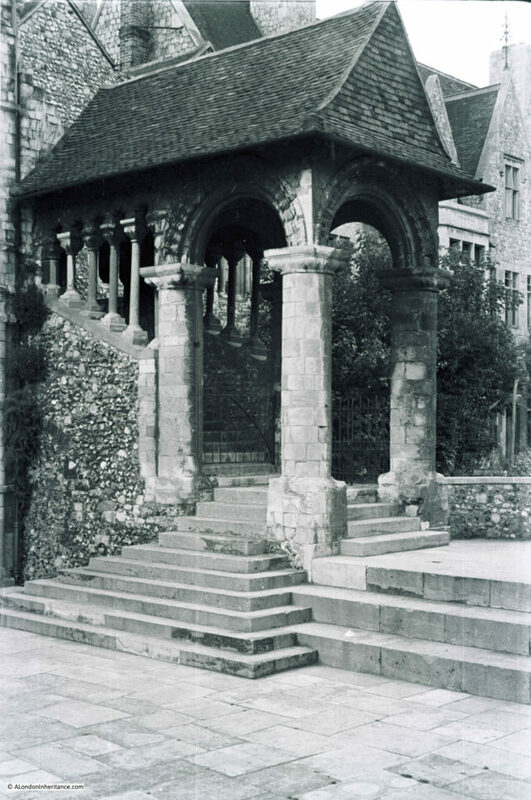 The architectural writer, Ian Nairn visited Canterbury in 1960 as part of a trip to a number of British towns and cities for a series of articles for the Listener magazine. These were later published in book form as Nairn’s Towns. 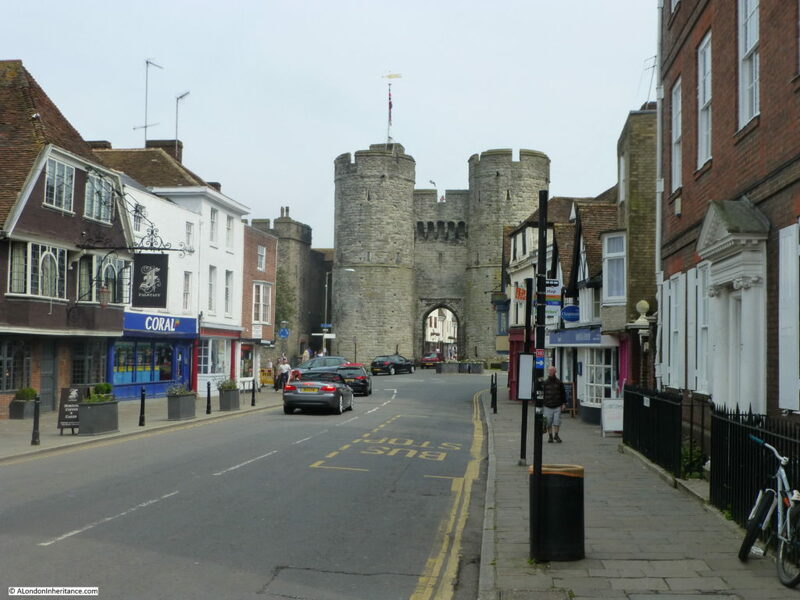 He describes Canterbury as the “Happy City”, praising the post war reconstruction of parts of the town with the rebuilt St. George’s Street being described as “a real attempt to match old and new honestly and sensitively” and that “St. George’s Street is not a collection of masterpieces, it is just a street where every building is decent“. The damage to Canterbury was due to the so called Baedeker raids when towns and cities were chosen for their historical and cultural significance with the Baedker name coming from the Baedeker range of guide books. 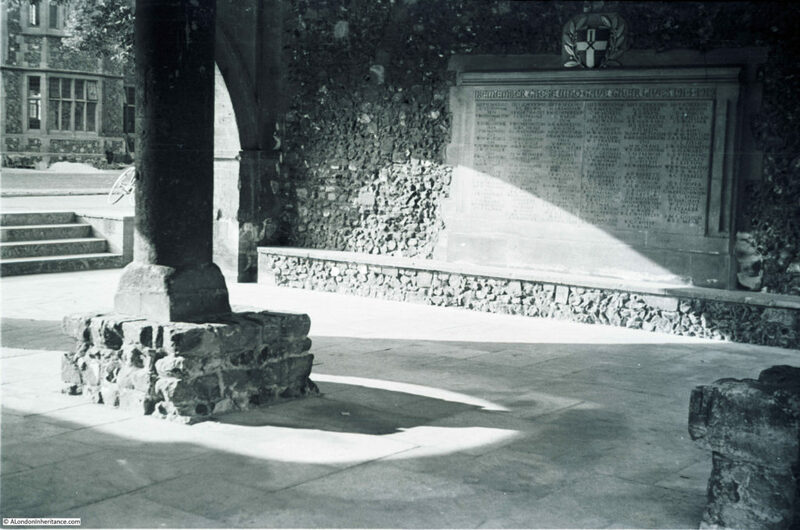 Although there was damage to much of Canterbury and many lives were lost, there was no damage to the Cathedral. 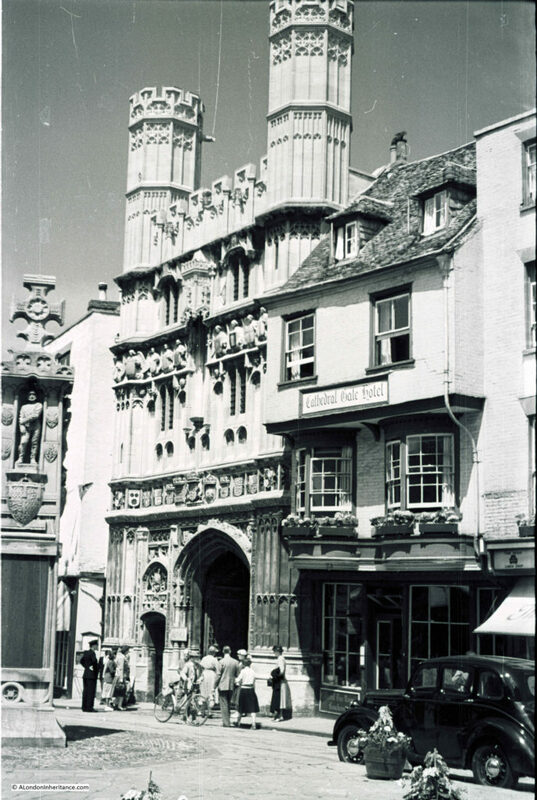 When Nairn returned to Canterbury in 1967 he criticises some of the reconstruction that had been carried out since his earlier visit, and walking round some parts of Canterbury today it is easy to see why, however these areas are the exception and Canterbury is an example of what towns could be like with careful planning. Walking up from Westgate and taking one of the side streets to the left we approach the Cathedral. In front of the entrance to the Cathedral precincts is the Buttermarket, a small square at the junction of Sun Street, Mercery Lane and Burgate. 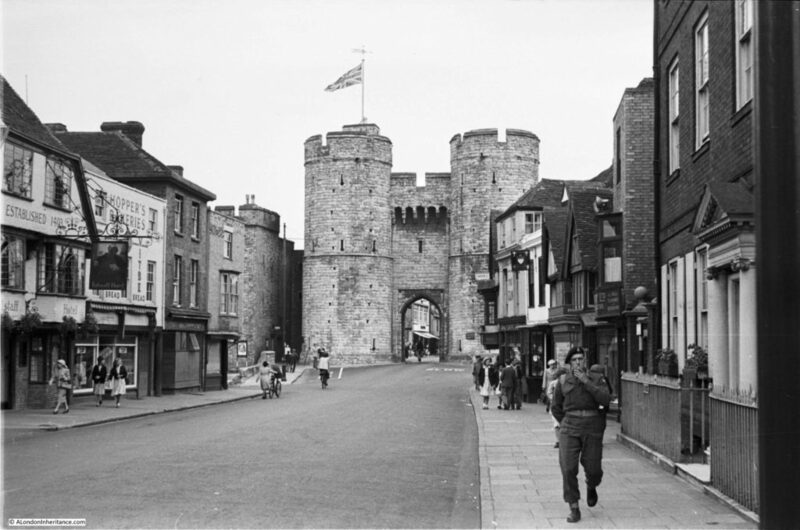 Writing about his wartime visit to Canterbury, the journalist H.V. Morton wrote in his book “I Saw Two Englands” – “Old streets, like Mercery Lane, cannot have changed much since the Middle Ages in appearance or in their function. They exist to sell cheap souvenirs which prove that the purchaser has been to Canterbury. These shops sold leaden medallions of the head of St. Thomas; now they sell postcards and ash-trays emblazoned with the city arms“. 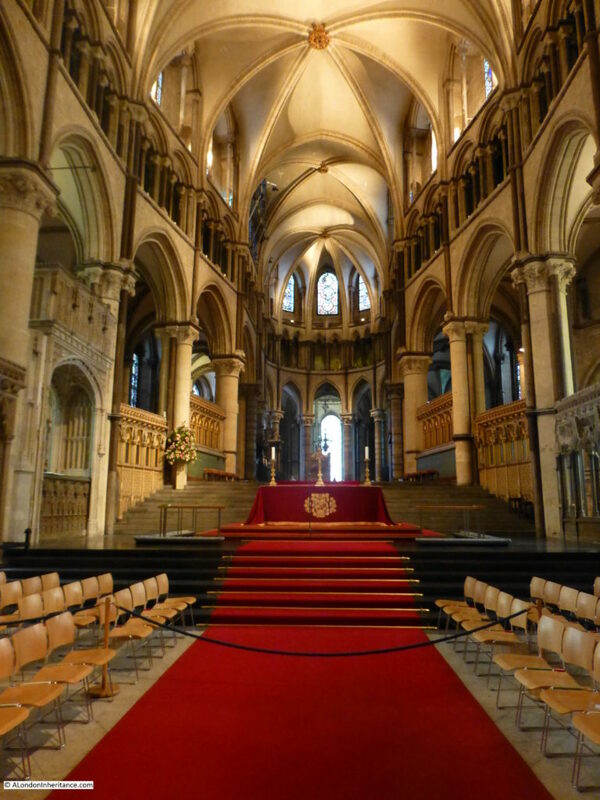 Canterbury has always been a city of pilgrimage and tourism. On one side of Buttermarket is Christchurch Gate, the entrance to the Cathedral precincts. Originally built between 1504 and 1521, the main changes to the gates were the removal of the tops of the towers in 1803 and the earlier removal of the statue of Christ and the original wooden doors in 1643. The tops of the towers were rebuilt in 1937 (you can see that they still look very new with sharp edges in my father’s photo from 1948) and the statue of Christ was replaced in 1990, you can see the empty place in the 1948 photo and the new statue in my 2016 photo. This was the scene in 1948, looking across the square at the Christchurch Gate entrance to the Cathedral and on the right the Cathedral Gate Hotel with a war memorial on the left. My 2016 photo follows. I could not get to exactly the same spot for my 2016 photo as this corner of the square is now covered in tables from the adjacent pub, so the above photo is the nearest I could manage without upsetting too many people drinking and eating. 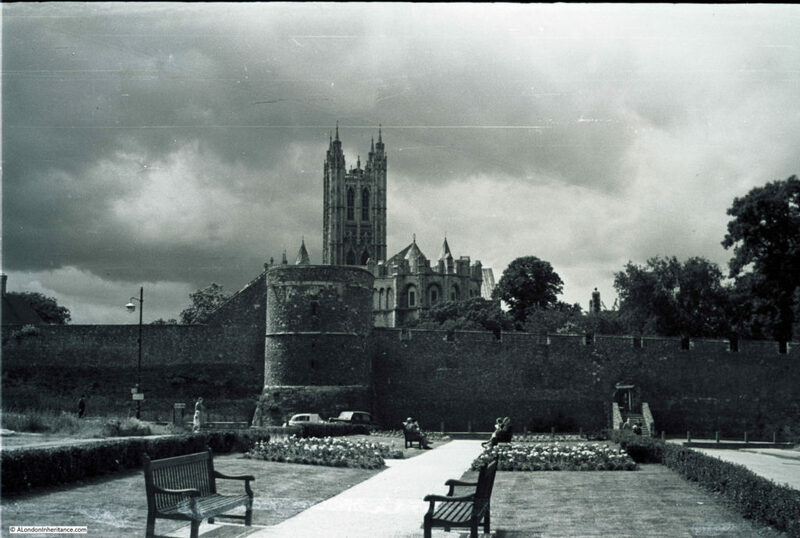 Again, there has been hardly any change in the buildings, the main change is the degree that tourism and the numbers of people visiting Canterbury has impacted the town, however it must bring some prosperity to the town and critically important funds to maintain the Cathedral. 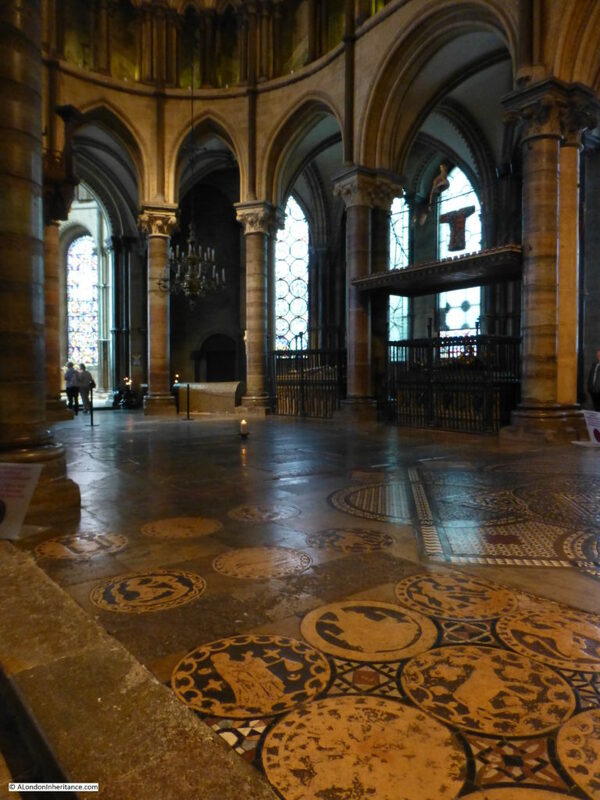 My father did not take any photos of the inside of the Cathedral, however a visit to Canterbury is not complete without a visit to the Cathedral. A church has been on the site since St. Augustines arrival in 597 with the earliest parts of the current Cathedral being built in 1077 and continuing to grow over the following centuries. 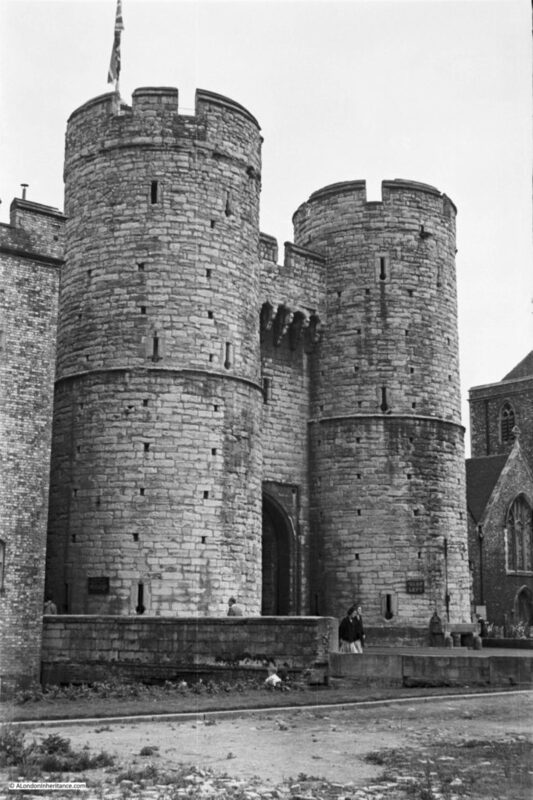 The nave was completed by the end of the 14th century, the south-west tower in the 15th century and the duplicate of the south-west tower being added in 1832. Walking into the Cathedral and looking along the length of the nave there is a forest of columns leading the eye to the far end of the church. The High Altar with the Trinity Chapel at the back. The Trinity Chapel, built over 800 years ago for the shrine of St. Thomas Becket which stood where the single candle burns today. The shrine was in this position from 1220 to 1538 when King Henry VIII ordered its destruction. 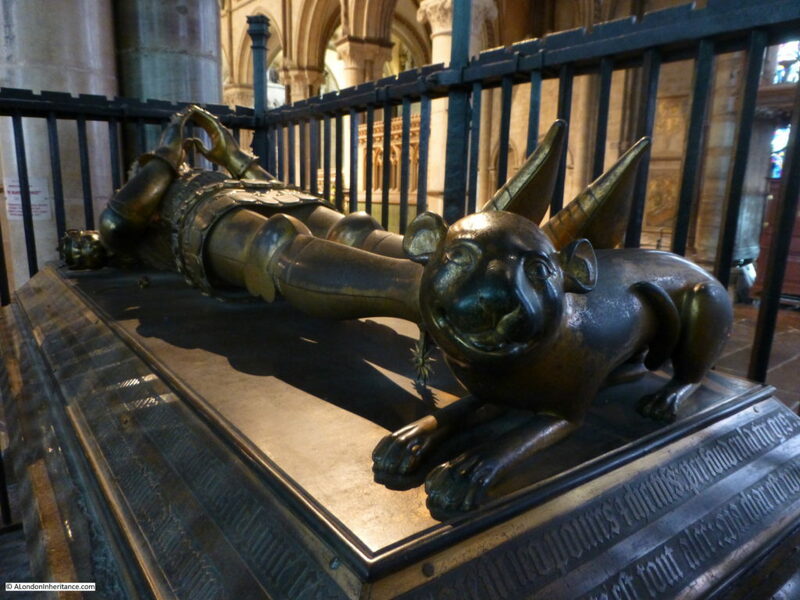 Within the Trinity Chapel are the tombs of King Henry IV who died in 1413. 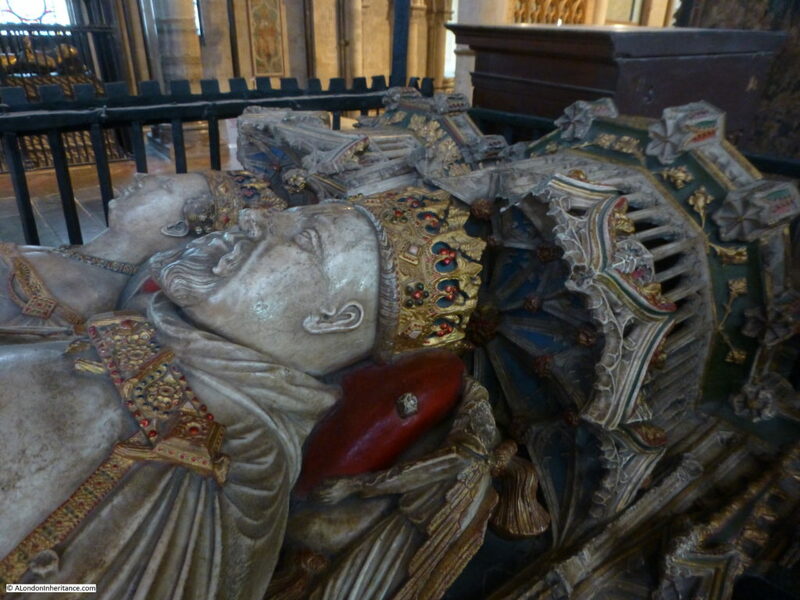 And the Black Prince who died in 1376. Looking around the Cathedral and there are carvings from across the centuries. 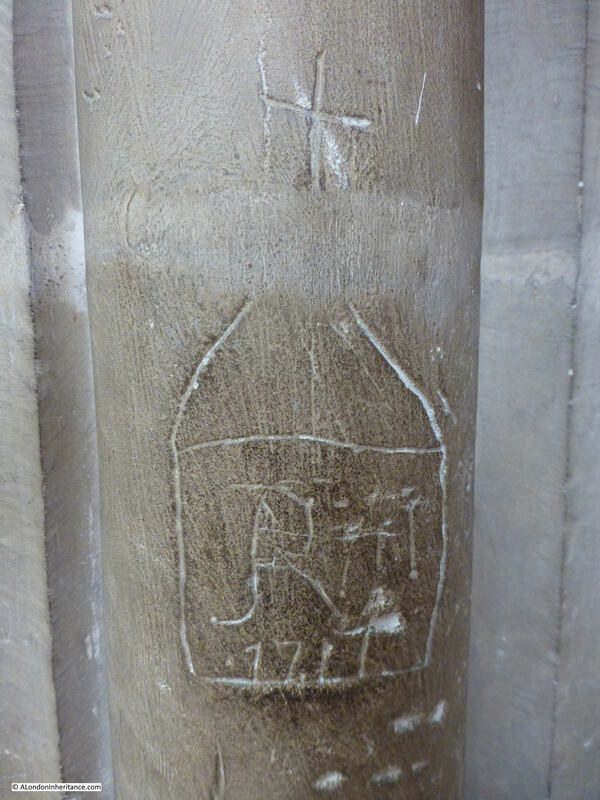 If this happened now we would call it vandalism, but seeing a carving made by an individual over 300 years ago provides a link with whoever stood here tracing this out in the fabric of the building. 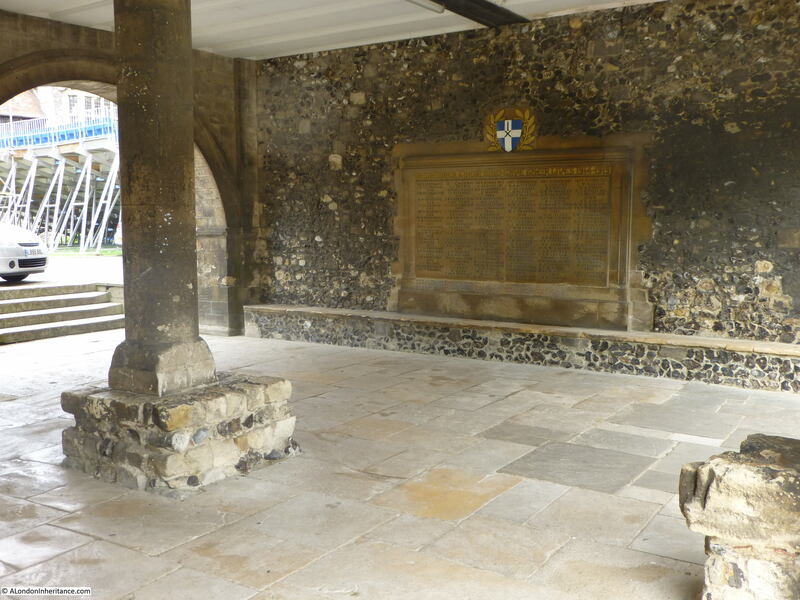 My father walked the grounds of the Cathedral which cover a wide area and includes the King’s School and it was whilst walking around the grounds of the school that I found the location of the following photo of the King’s School war memorial. The same location today. Apart from the car and the scaffolding seen through the arch to the left, the scene is the same across the 68 years. 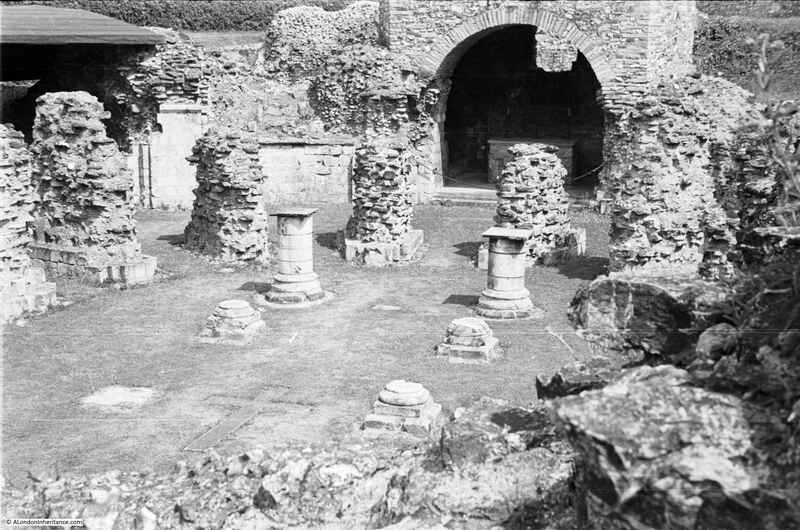 Look at the square base to the round pillar on the left – the same flints can be seen within the stonework. My father also took the following photo within the King’s School grounds, however despite a long walk around the grounds I could not find the location, although I am sure it is still there. It will have to wait for a return visit. 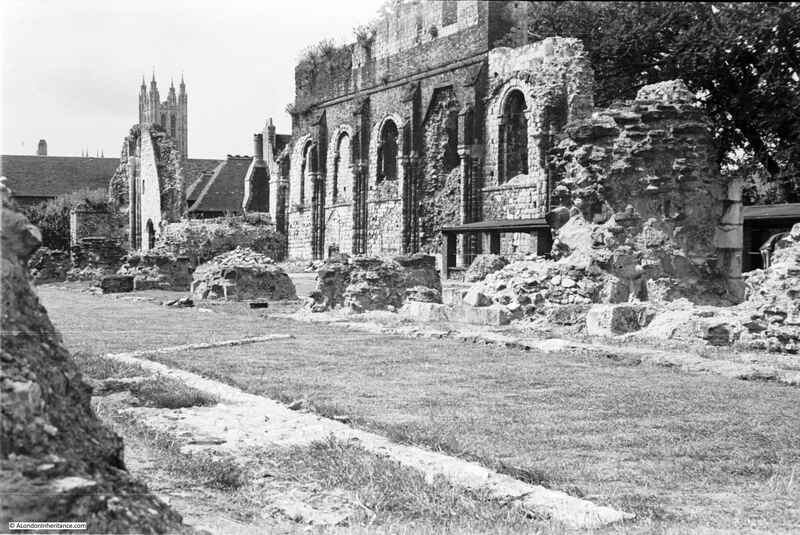 Outside the city walls is St. Augustine’s Abbey, founded at around the same time as the Cathedral and continuing as a Benedictine Monastery until the dissolution in 1538. 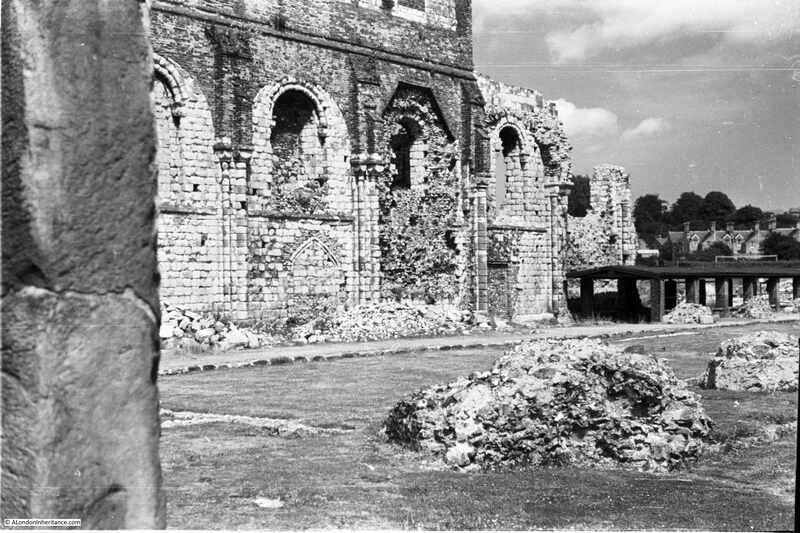 During the following 400 years the Abbey buildings were used for a range of different purposes, including a brewery, were part sold, some building were destroyed and finally some considerable damage by bombing in 1942. 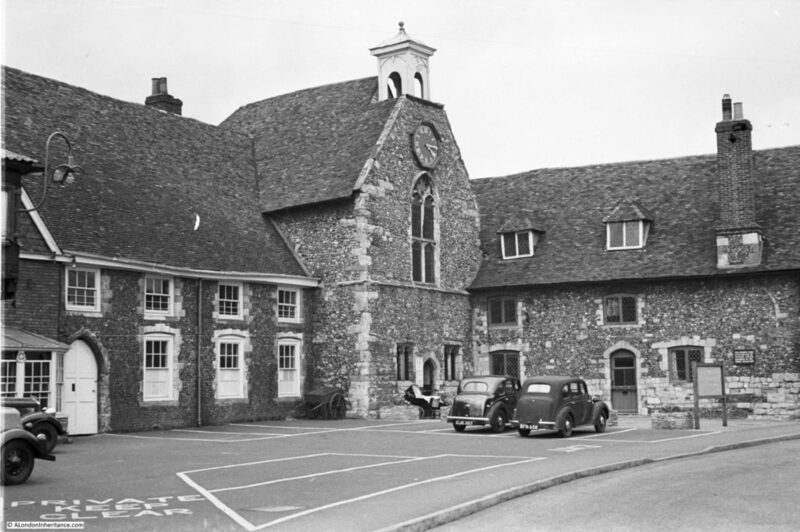 A number of the buildings are now used by the King’s School with the rest now under the care of English Heritage. I ran out of time to visit the Abbey, although my father did visit and took these photos in 1948 and I suspect the Abbey is still much the same. 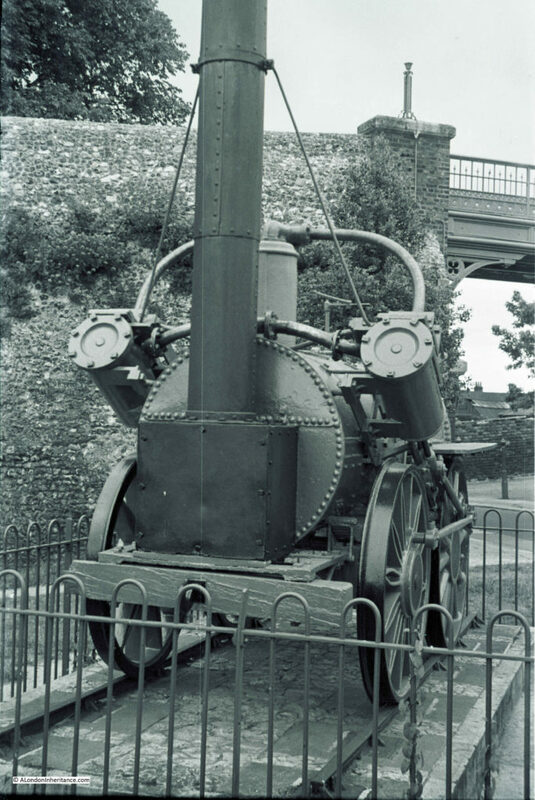 In two of my father’s photos from Canterbury were the following of a locomotive. This is the Invicta built by Robert Stephenson in 1829 to run on the Canterbury and Whitstable Railway. The Canterbury and Whitstable Railway was the first railway in the world to provide a regular, steam powered passenger service. It opened in 1839 and was also known as the Crab and Winkle Line as it also provided a route for the produce from the fishing town of Whitstable to be taken into the centre of Canterbury. The Invicta was fully restored in 1977 and is now in a much more secure location, on display in the Canterbury Heritage Museum. There is much to see in Canterbury and during a day visit I did not get the opportunity to photograph all the locations in my father’s photos. Too much time spent walking the centre of the town, exploring the Cathedral and the grounds of the Cathedral and school, finding an excellent second hand bookshop and last, but by no means least, an excellent pub. I will need a return visit to photograph the locations of the following. A wider view of the city walls, gardens and cathedral tower. 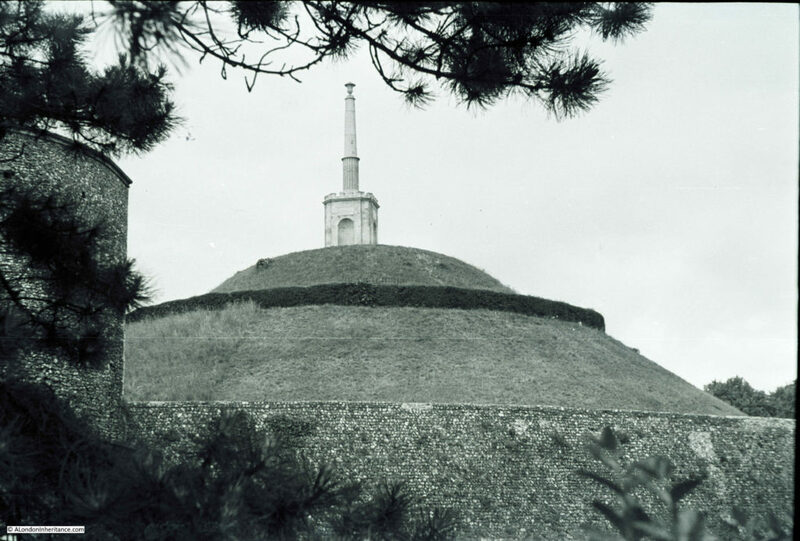 Mound and 19th century monument in the Dane John Gardens. The mound is the site of a Norman motte and bailey castle. The Canterbury Heritage Museum. The building in its current form dates from 1373, having been a medieval alms house from about the year 1200. 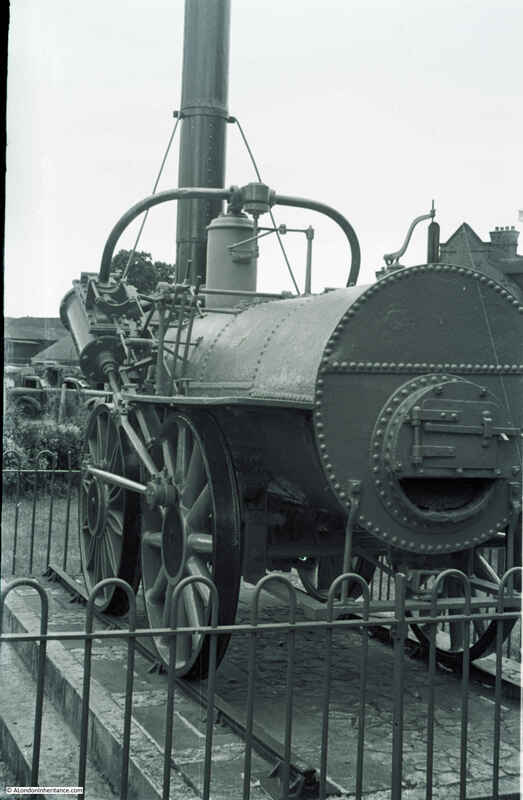 The museum is still much the same as in 1948 and is now the home of the Invicta locomotive. Canterbury is a fantastic city to explore. With some exceptions, the centre of the city has not suffered the level of post war destruction or out of place architecture that has turned many other towns across the country into identical shopping centres. Canterbury is still a town with its own identity. I still find it strange to stand in almost the same place as my father did 68 years ago and photograph much the same scene as in many of the photos of Canterbury. Finding out about each of the above photos identified several individual topics that could each fill a large post, for example, the history of the Invicta and the Canterbury and Whitstable Railway is fascinating. As I found out, Canterbury requires more than a single day to explore and I will be returning to find the sites I did not get to and to discover more of what Ian Nairn called – the Happy City. 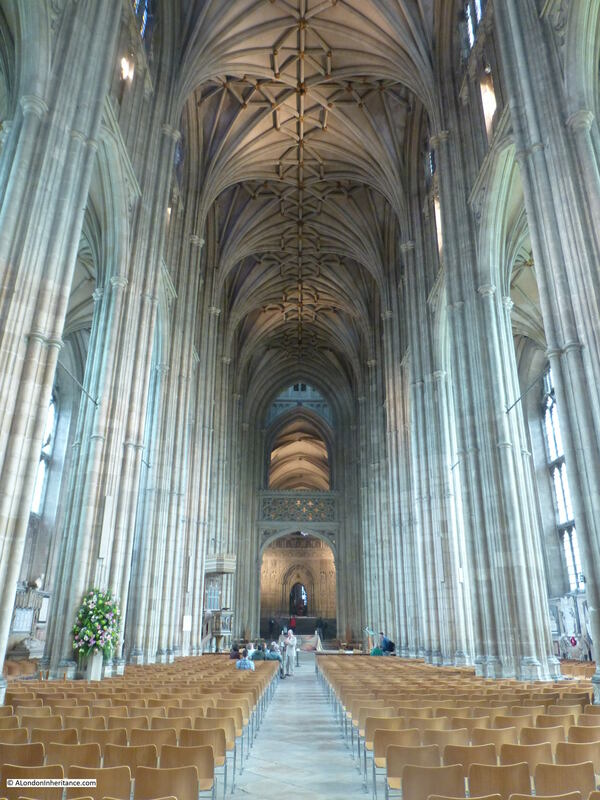 This entry was posted in Cycling Around Britain and tagged Canterbury, Canterbury Cathedral, King's School, Westgate on August 7, 2016 by admin.